Hopefully we will answer all these questions and more in our FAQ. What is physical modelling synthesis? Physical modelling synthesis is a method by which sets of mathematical equations and algorithms are used to simulate the behaviour and sound of real, physical musical instruments. The Skoog uses physical modelling synthesis in a number of its instrument sounds. These "virtual instruments" are perfect for expressive musicianship and respond to even the most subtle differences in Skoog playing style. What sounds do I get with the software? We also include a set of sample presets to use with the Skoog's Sampler mode - bird song, water sounds, animal sounds, singing voices, and more - just drag the folder onto the skoog to get started. The new MIDI mode opens up the Skoog to limitless sound possibilities - you can use the in-built MIDI instrument sounds that come with your sound card, or connect the Skoog (using an appropriate usb MIDI interface) to any controllable MIDI device to control new sounds using the Skoog. Can I record my own sounds onto the Skoog? Yes. On the sampling tab there are 5 coloured panels - one for each side of the skoog. On each panel there's a circular red record button on the top right hand side. Click this to begin recording, and again to stop. Your recording will then appear in the coloured panel for use straight away. Alternatively you can edit, trim, reverse or copy your sound to all other sides, then apply a musical scale to your sound so that you can play a tune with it - all of this is possible from a single sound recording! Audio scrubbing is the process of moving through an audio file whilst simultaneously auditioning the portion of the file under the "playhead" (the term "scrubbing" copes from the days of reel-to-reel tape recorders). The Skoogmusic software Scrub mode (you'll find it on the sampling tab) lets you use the Skoog to control the playhead position with an audio file, dynamically. Scrubbing works with pre-recorded audio files or you can record your own sounds straight into the Skoog using a microphone. We've put a little playhead display on the sample window so you can "see" where you are in the sound. As you press harder on the Skoog you'll see the playhead move from left to right through the audio file and at the same time you'll be able to hear the audio from directly under the playhead. Scrub mode works really well with vocal and instrument samples in particular, and some really fun and interesting effects can be explored using recordings of continuous transitions between two or more different notes, dynamics and vowel sounds within a single sample. How do I load samples onto the Skoog? to load sample sets (5 samples at a time), drag one of the special "sample set" folders onto any of the coloured panels. to load single samples (one at a time) onto the Skoog, simply drag a .wav or .aiff file onto the panel with the colour of your choice. What backing tracks/samples do I get with the software? Remember, of course, that you can use your own sounds too! Just make sure that they are in .wav or .aiff formats (.mp3 can also be used for backing tracks). Have a look at in the user manual for guidelines on using your own samples/loops. Can I create my own Skores? You can create your own skores to follow along with in using our Skores Notation Pack. This contains everything you will need to put together your own compositions in word/powerpoint etc. Can I create my own Skores files to load onto my Skoog? No. Well, not unless you are able to programme code in XML. This will feature in an upcoming version of the software and/or in SkoogToo. If you have any particular requests for a song you would like to be transcribed for Skoog, please use our contact frorm to get in touch. Can I load new Skores files into the Skoog Software? Yes. Just click the load button on the skores page and select the skores file of your choice. What file types can I use as a backing track? You can use .wav, .aiff or .mp3 files as backing tracks. We operate what in technical terms is called a "concurrent users license". This basically means is that you can install the Skoogmusic software on as many computers as you like, and use it with as many Skoogs as you can lay your hands on. In a school this would mean, for example, that you could install the software on a computer in every classroom and carry the Skoog from classroom to classroom, rather than having to cart a laptop or PC around the school on a trolley. Or if you are a peripatetic music teacher or music therapist you can install the software on the computers of the schools and clients you visit, leave your laptop at home and travel light. All at no extra charge. Great, huh? Do software updates cost extra? 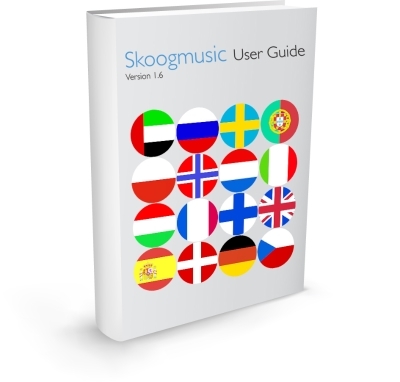 At Skoogmusic, we are constantly striving to improve usability and add new features to our software. Software updates will be free to download (until our next major update) by registered customers. We will email registered customers when we release new updates, which can then be downloaded via the links provided in the email and from the support section. If you wish to delete your account, please use the Contact Form to tell us you want to leave - remember to include your username or email. We will reply when we have deleted your account.